The MOOC was referred to as "a happening" by Hamish Macleod, one of the instructors in the MOOC. "Make Your Own Kind of Music" by Mama Cass Elliott captures the spirit of my ideas around being MOOC real and in rhythm. I have been thinking about two things in relation to a MOOC. One is the notion of being "real" or human. The other has to do with being in rhythm. I have been trying to understand the rhythm of a MOOC. After two MOOC experiences, I have come to the conclusion that the learner needs to create their own rhythm. The MOOC truly is a container in which I can create the contents to be in rhythm with my needs. Then there is the idea of being "real." 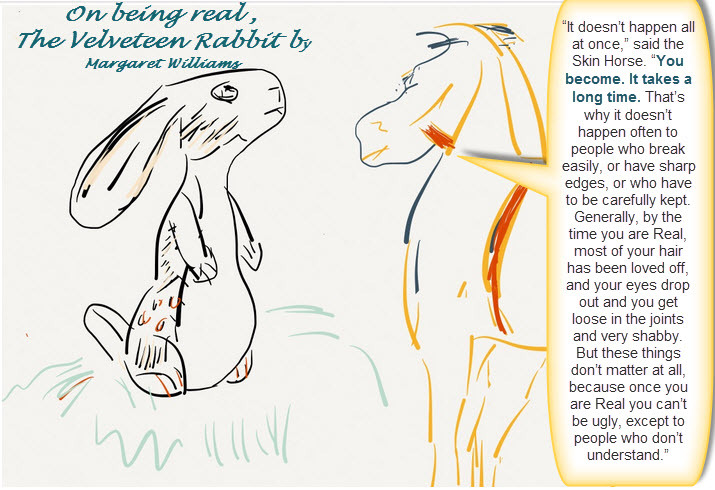 When thinking about being "real" my mind is drawn to The "Velveteen Rabbit" story by Margaret Williams. Figuring out how to be "real" in other words, to develop a social presence and make connections with others in an online environment takes time.